With all the holiday posts that I have done lately, my ground beef recipes and Souper Monday series have not been as regular as I had hoped, but after the first of the year, they will both be back as weekly features. I am really excited to continue both of these series next year. 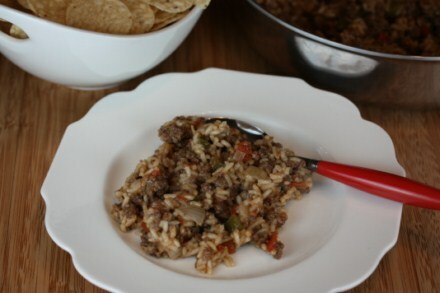 Today though I do have another ground beef recipe for you and it is perfect for the busy holiday season. 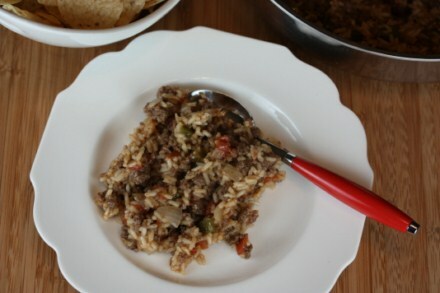 Ground beef taco rice dinner is so quick and easy to make. It contains pantry ingredients, and is great leftover as a burrito or enchilada type filling. optional ingredients for serving: sour cream, chips, cheese etc. In a skillet cook ground beef, onions, and green pepper until meat is done and onions and peppers are tender. Drain off any fat and add tomatoes with green chilies, water, rice, taco seasoning, and salt. Bring to a boil and then reduce heat to low. Cover and simmer for 15 minutes, stirring occasionally. Uncover and cook 10 or so more minutes or until rice is done. I just want you to know that I have been following your blog here and I am thoroughly enjoying it. Your recipes are FABULOUS! I’m so not creative in the kitchen. Thanks for sharing your ideas. Keep it up! Thank you! And Merry Christmas to you. Thanks for this easy recipe! It is going on the meal plan this week! This is delicious! All five people in my family loved it. I have a rice cooker so I cook up a pot full of rice and divide it by putting 2 cups into a quart size freezer bag. I cook up 10 lb of ground beef and divide it into 1 pound packages. That makes this taco rice recipe my new “go to” meal when I’m not prepared for what’s on the menu. So I put the hamburger in the pan, topped it with taco seasoning and stirred in the rice and Rotel. We put it on flour tortillas and topped it with cheese and sour cream. When it was gone the family still wanted more. Thanks again, Lynn, for such an awesome recipe! hamburger has gotten so expensive Ive stopped using it. I now get cheap sausage (kroger brand) turkey from Aldi’s and mix the two. I put oatmeal and an egg in it. It turns the two pounds into three. one pound I make meatballs the other two pounds goes in the freezer. My husband hasn’t even noticed. Thanks! I am glad your family enjoyed it! I am not sure why the rice would not have gotten done, unless it had to do with times this by 8. I have doubled it before, but not done it in that large of quantity. I would guess with the much more ingredients in it, it would take a lot longer to cook. Hi – I cook the rice separately, along with sweet corn, and allow everyone to compile their own meal. Lining up the rice first, hamburger mixture (also containing one can of beans – either chili, black, pinto, whatever for each pound of meat), cheese, lettuce, and sour cream. We also spoon crushed Doritos or plain tortilla chips on top of all of it! Using large pasta bowls, this makes a fun dinner, and my grown children absolutely love it! The rice definitely cooks better separately! I made this for dinner tonight and it was delicous! Even my picky dad came back for a second helping! This is a must try! I am glad that your family enjoyed it! I have never tried this with brown rice, but brown rice takes longer to cook and I think more liquid. Are you adjusting the time and liquid amount? Yes, the last time I cooked I had it on for over an hour. And it still was hard and crunch served it and the kids still ate it. I run an in home Daycare and I’m Trying to alter recipe to meet the new food ptogram rules. Must serve a whole grain with one of your meals.